Extremely sturdy professional elliptical trainer, adjustable resistance and incline, fully electronic control, easy-to-read display, quiet running. 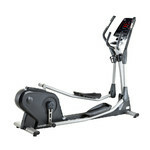 The Elliptical Trainer inSPORTLine Forsan is a professional machine suitable for commercial gyms and clubs. Its magnetic brake system, sturdy structure and 150kg weight limit ensure stability, safety and long service life while the ultra long stride length make the exercise comfortable even for tall users. The 12kg flywheel provides enough resistance to satisfy even the most demanding users. Aside from resistance, you can also adjust the incline, which simulates uphill running. The large, anti-slip pedals and two pairs of handles (one of which is adjustable) provide comfort and safety. The fixed handles feature built-in heart rate sensors. The uneven surface adjustment system and bottle and tablet holders are a must. 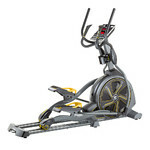 The Elliptical Trainer inSPORTLine Forsan features an intuitively operated console with an easy-to-read display on which you can follow all the important information, such as time, distance, calories burned, speed, resistance mode, incline mode, performance, heart rate and revolutions per minute (RPM). Heart rate is measured either via the sensors built into the handles or a chest strap (which is included). 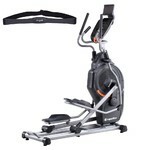 This elliptical trainer offers as many as 19 programs (12 preset and 4 user programs). You may also appreciate the WATT program (performance tracking), HRC program (which adjusts resistance according to the heart rate level) and basic manual program. All of the above makes the Elliptical Trainer inSPORTLine Forsan a perfect addition to any commercial fitness centers and/or club gyms.